New York, Jan 25 (IANS) A leading Indian-American restaurateur, Harendra Singh, has pleaded guilty in secret court proceedings to trying to bribe New York Mayor Bill de Blasio, according to court documents, the media reported. Singh had admitted in a “sealed courtroom” before a Federal judge on Long Island in October 2016 to bribery and wire fraud in connection with campaign contributions made to de Blasio, the Times reported citing the court records. This was made public only on Tuesday — more than a year later — in connection with the trial of Edward Mangano, the former head of Nassau County on Long Island, the Times said. Singh also pleaded guilty to six other charges in unrelated bribery schemes involving officials on Long Island and businesses he owned there, the New York Times said. The mayor was not charged in the case and was cryptically referred to in the court documents as “Official #2,” which the newspaper said “clearly match de Blasio”. Prosecutors sometimes do not identify politicians by name in court documents. Singh’s trendy Water’s Edge restaurant, which was at the centre of the bribery attempt of the mayor, closed in 2015. The restaurant was located on the shore of the East River on city-owned property and he sought the help of the mayor’s aides in renewing the lease, which ultimately fell through. The Times said that according to records “Singh was one of the earliest large donors when de Blasio began his mayoral campaign in 2010 and he, his family members and other associates ultimately raised a total of about $33,000 for the mayor”. The records also refer to a fund-raiser that Singh hosted at his restaurant in October 2013, the newspaper said. In December 2014, Singh asked an aide to the mayor for help with renewing his restaurant’s lease and a senior aide arranged a meeting next July with the head of the city agency involved in the restaurant lease “in an effort to pressure the agency to make its proposed settlement terms more favourable” to Singh, the newspaper said, citing court documents. While New York city and Singh were close to finalising the renewal on terms favourable to him, Singh was arrested as part of a corruption investigation on Long Island. It was not known if Singh received any sentence. The case involving Singh and de Blasio was originally investigated by the Federal Bureau of Investigation and the Federal prosecutor’s office for the Southern District of New York and did not charge de Blasio but “harshly criticized him and his fund-raising practices” the Times said. The case against Singh was instead filed by the office of the Federal prosecutor for Eastern District of New York. Preet Bharara, who was then the Federal prosecutor for the Southern District of New York, tried tried in 2013 to prosecute Indian diplomat Devyani Khobragade on charges of underpaying her household help. The diplomat was strip searched after her arrest creating a diplomatic incident with India and he had to drop the case when New Delhi retaliated by strictly enforcing existing regulations against American diplomats. 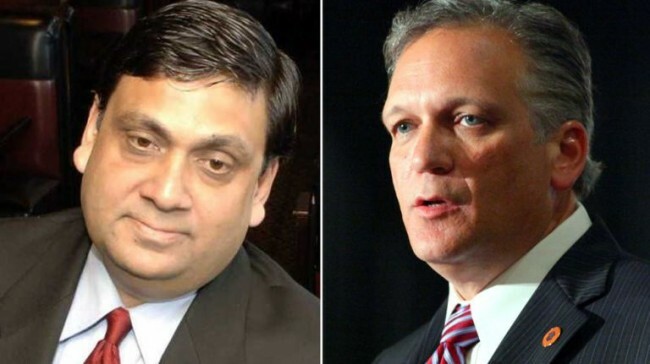 Another prominent Indian-American, hotelier Sant Chatwal, pleaded guilty in 2014 to making $180,000 in illegal campaign contributions to Democratic Party leader Hillary Clinton and to two members of Congress. That case was also pursued by the prosecutor for the Eastern New York District. Chatwal did not get any prison time. The court filings did not name the leaders, but several media identified Clinton. Babulal Behra, the 83-year-old father of Indian-American Democratic Congressman Ami Behra, was convicted in 2016 of illegally funding his son’s election campaign with $260,000 and sentenced to a year and one day in prison. The Congressman was not charged.